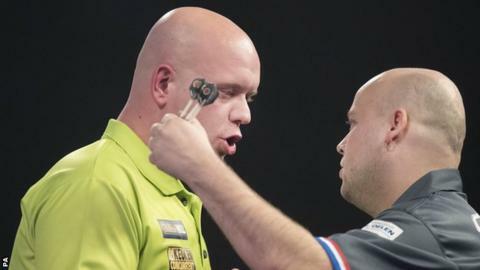 Michael van Gerwen began his PDC World Championship defence with a comfortable victory over Christian Kist at Alexandra Palace. The 28-year-old world number one beat fellow Dutchman Kist 3-1 on the first day of the Championship. Van Gerwen, who beat Gary Anderson in last year's final, averaged 107.4 against Kist. The two-time champion faces England's James Wilson in the second round, who earlier beat Krzysztof Ratajski 3-1. "A great game like this to start off a tournament is always nice for your confidence," Van Gerwen told Sky Sports. Elsewhere, Steve Beaton beat William O'Connor 3-1, and Gerwyn Price beat Ted Evetts 3-0.